Hi everyone! It’s Lauren here from Molly and Mama. 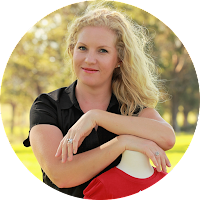 I’m so excited to be part of the tickle creative team as a guest contributor this year! 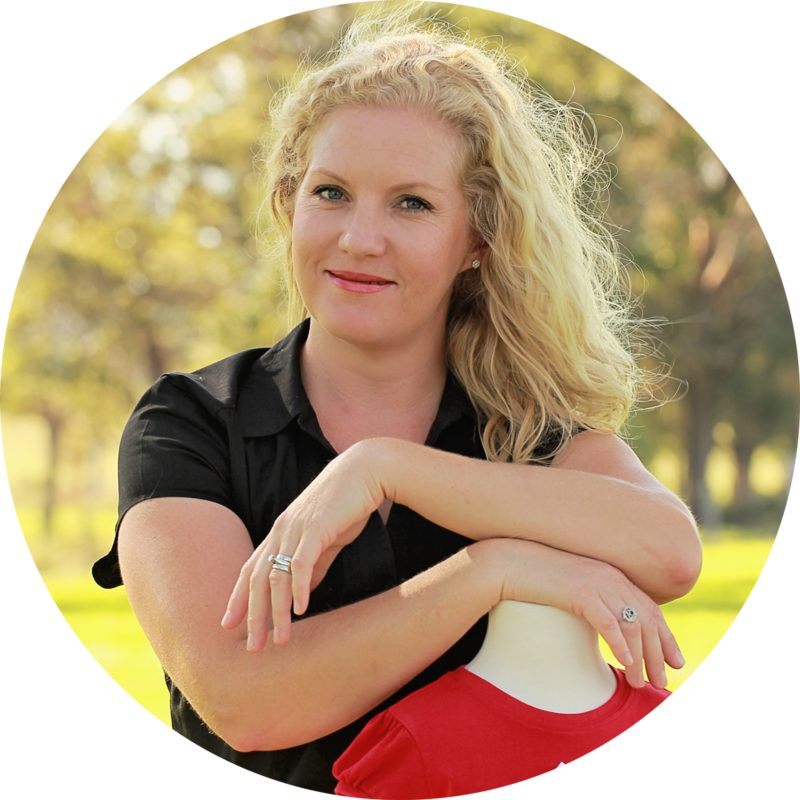 If we haven’t met before, you can read my 'meet the maker' feature on tickle to find out more. But let me just start by saying that I am a huge fan of hand sewing and stitching. And what better medium to use for this kind of handiwork than wool felt? It’s so versatile and very easy to work with. So I’m really looking forward to bringing you some fresh new felt projects, ideas, inspiration and more. But before we get to that, I thought it was pretty important to give you a bit of an idea about what wool felt actually is, and how it can be used. It’s surprisingly interesting! Felt is made by matting, rubbing, pressing and condensing fibres together. Different fibres are used for this process, including acrylic, rayon and wool. The result of this process is the creation of a non-woven textile fabric. Because the fibres lock together in the felting process, this fabric won’t unravel like woven fabric does. 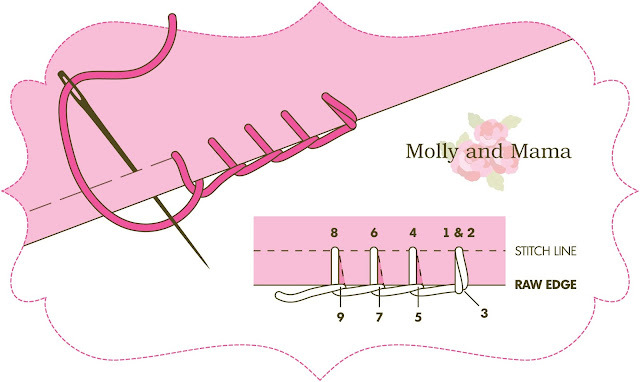 This makes it ideal for sewing, and it’s especially suitable for hand stitched projects. 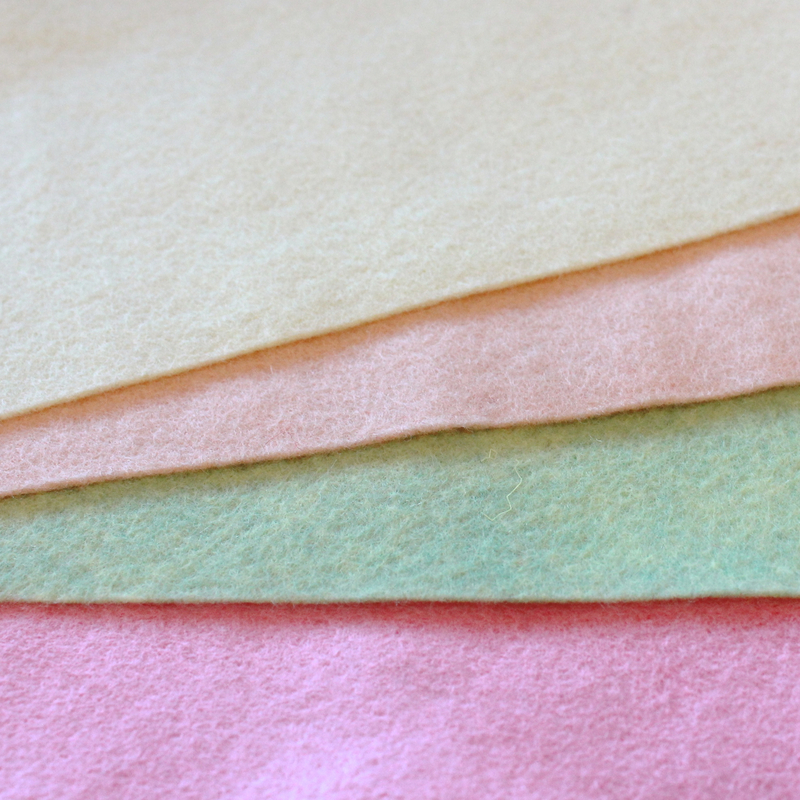 Wool felt is not to be confused with felted wool. This is actually wool fabric that has been washed and then dried with heat. The drying process shrinks the fibres, thickens the fabric and gives it a soft and fluffy appearance. Felted wool is still a fabric though, so it doesn’t lend itself to hand sewing as much. It’s great to use for machine-sewn toys and softies though. To add to the confusion, there is also needle felting. Special barbed needles are used to transform regular fibres (like wool) into felted fabric, by tangling the fibres together. The maker can create something flat, or even a dimensional sculpture, using various fibre types in different shades. Wool felt can actually be used for this process. Needle felting however, is very different to sewing with wool felt. So you’d like to stitch a felt pin cushion, make a soft toy or embroider a felt project you’ve been wanting to try for ages. Where do you start? At the very beginning! You’ve seen those wonderfully colourful squares of felt at your local craft store, haven’t you? They seem so bright and cheery and come in such an amazing array of happy shades. So you’d be forgiven for thinking that this sort of felt would be great for your toy making or hand stitching. This acrylic felt certainly has its place, and is great for kids’ craft projects. But if you’re going to spend your precious time stitching up something special, you want it to last. Be sure to honour your work, by using the best materials you can afford. I recommend wool felt. And the higher the wool content, the better your creations will be! Products may be described as wool felt, but are often a blend of wool and another fibre such as rayon. Blended wool felt is still great to work with and a little more cost effective. But if you’re only creating small projects, and you’d like your creation to last, then 100% wool felt is the way to go! It is such a beautiful medium and it really makes a difference to the look and feel of every piece you’ll make. It will last longer, and keep its shape better. It’s strong and durable. It’s less likely to pill or bobble, so it’s great for hand-making toys or pin cushions. It cuts well, doesn’t fray like fabric and can be easily shaped and moulded. Wool also has a natural resistance to staining, fire, water and mildew, so it’s great for those projects that you really can’t clean by throwing them in the machine. The range of colours that wool felt comes in these days is truly inspiring. You can find deep and vibrant hues and pretty pastel shades, and lots in between. So you’re sure to find a collection of colours that suits the needs of your project, or that inspires your imagination. Look for wool felt at your local sewing or quilting store (it’s always lovely to support the local small businesses in your area). Or, see what you can find online. Having bought felt from a varied range of sources, I have to say that you do really get what you pay for. Sometimes it’s worth spending that little bit extra, to get just the right colour or the best look for your softie, pin cushion or special piece. Once you’ve stitched with 100% wool felt, it’s hard to go back. Whether you have purchased pre-cut felt squares or felt by the yard, be sure you store it well. It is best to keep it flat. If possible, place it in a lidded container to be sure its protected from nasties, like wool moths (or little ones who love to ‘help’ mummy cut shapes for sewing!). You can iron 100% wool felt if you need to. Just use a wool heat setting and cover the felt with a press cloth so you don’t damage the wool fibres. Don’t use wool felt on a project you wish to machine wash. Wool felt and washing machines don’t mix! Dry cleaning is your first option. Spot cleaning wool felt is also recommended. If dry marks don’t brush off, use a damp cloth to gently dab away at them. Don’t rub the felt, or add soaps or cleaning products. These will affect the look of the wool felt fibres. 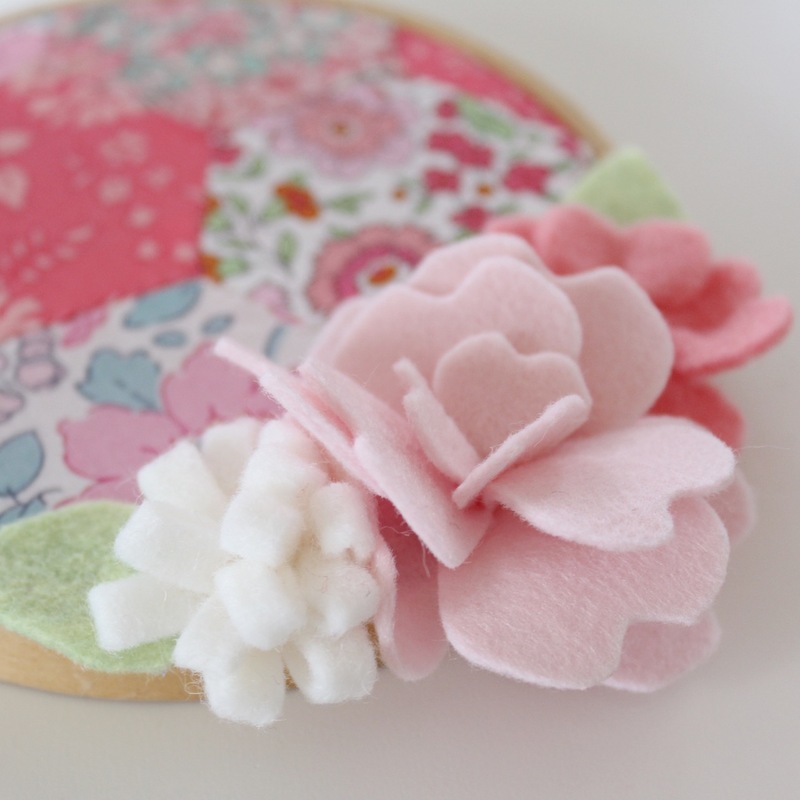 The best way to ensure you have a beautiful felt creation, is to be careful when you’re cutting. Precision is the key. Use small sharp scissors with a short blade and pointed tip to get a neat finish and those wonderfully crisp edges. You don’t want to pull the felt pieces out of shape by using blunt tools. A sharp blade on your rotary cutter is also a must. When cutting shapes from a pattern, there are several methods you can use. The most popular by far, is to trace your template piece onto a product called ‘freezer paper’. The shiny side of the paper will adhere to felt when ironed, making it easy to cut around the outline of your shape. You can then just peel the paper away. But what do you do when ‘freezer paper’ isn’t readily available? Traditional paper templates can also be effective. Don’t cut the paper template out on the line before you start, but leave a small border around the template edge. 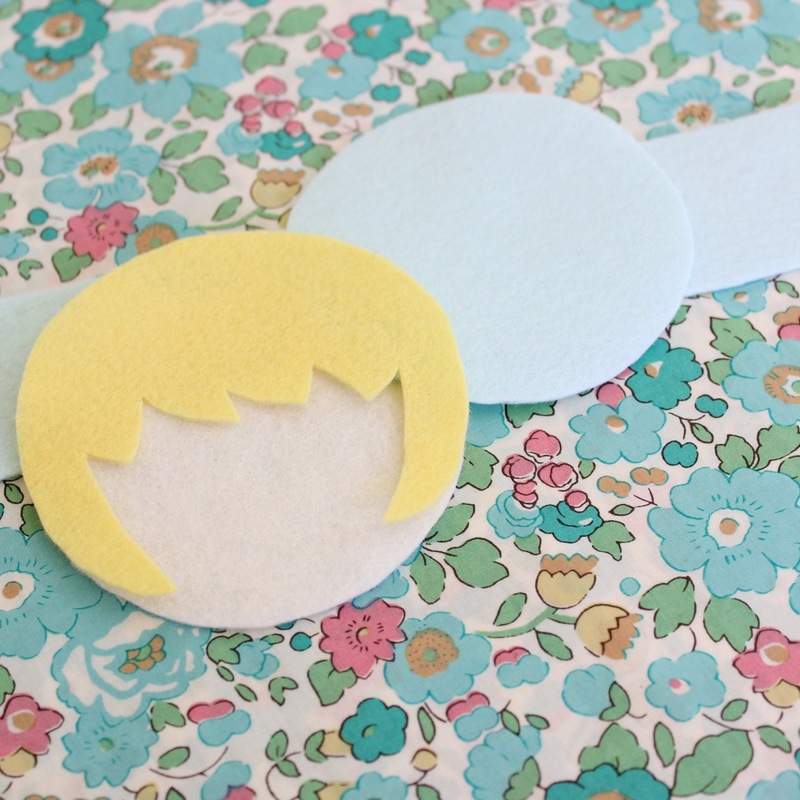 Pin the paper template to your felt and cut out your shape on the line. If you need to cut more than one shape from the same template, use the piece of felt you just cut as a template, rather than the paper. You’re more likely to get more uniform shapes that way. What if your paper template is too small for pins? Invisible Sello tape (that seems less tacky than sticky tape) can also be useful for sticking the template down for cutting. Carefully remove it after use. And if you really want to cheat, you can also purchase pre-cut die cut shapes online! Or use a cutting machine like the Brother Scan-N-Cut. Choose the best thread for your project. If you’re just starting out, a fabulous product to use is cotton embroidery floss like DMC. It’s readily available and comes in a huge array of colours. The skeins of floss or thread are made up of six strands, which you can separate according to the needs of your project. Two or three strands of floss work really well. Which thread colour do you choose? I love to coordinate my thread with my felt colour. If you can’t get an exact match, choose a thread colour that is a shade darker than your felt. Or select a contrasting shade to really stand out! Choose the right sized needle. Large needles can leave holes in your work, so choose a needle that accommodates your thread type, but also treats your felt well too. Embroidery needles are great for felt. They have larger eyes so they can fit larger floss through them. Learn to master ‘whip stitch’ and ‘blanket stitch’. They are terrific stitches for felt. Whip stitch joins two felt pieces together. Blanket stitch gives a decorative finish and can edge fabrics by forming a ‘hem’. For this reason, it’s a great stitch to use to create a strong bond between two felt edges. It’s also wonderful for appliquéing one piece of felt onto another. You’ll need to master a few embroidery stitches if you want to give your work some personality too. But these can also be very simple. Straight stitch, back stitch and French knots are some wonderful stitch types to start with. They’re quick to master and very effective. Here's a link to my Back Stitch Tutorial. As with all sewing, practise makes perfect. Be careful about your stitch size, length and consistency. If you’re not happy with the finish of your stitching, don’t be afraid to pull it out and start over. Wool felt can be very forgiving like that! 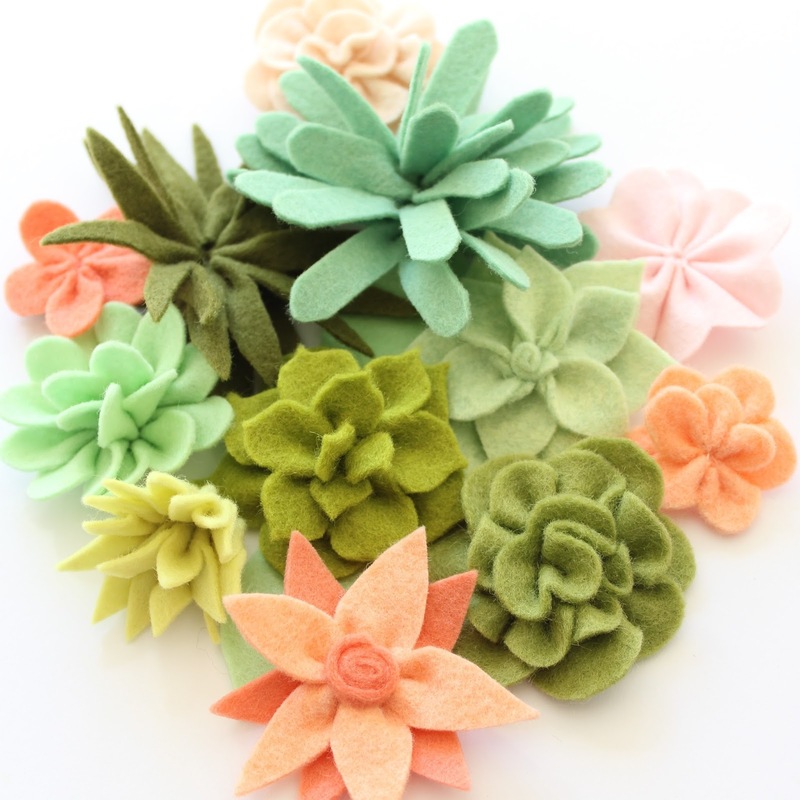 5. what can you make with felt? When stitching felt projects, you are only limited by your imagination. And if your imagination doesn’t really feel like a work out, Google will always help. 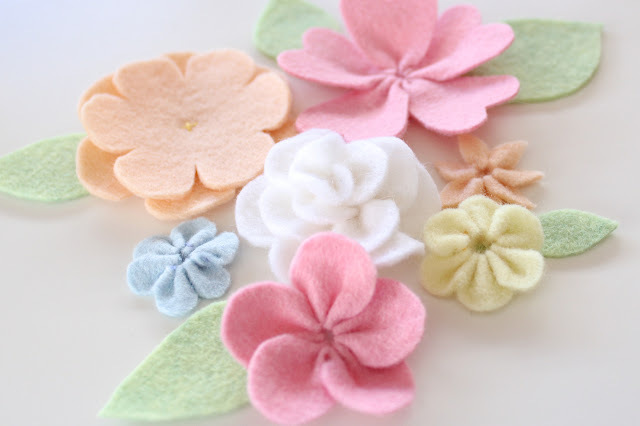 Having such a love of wool felt, I also have a range of lovely free felt tutorials on my blog at Molly and Mama. I hope you've found these tips helpful. If you've got more tips to share, please leave a comment. Molly and Mama is the home of whimsical, original PDF patterns... and designs for appliqué, felt craft, embroidery and stitchery. With lots of photos, simple to follow instructions and clear directions, these patterns are ideal for the beginner and suit all sewing levels. They're easy to follow, fun to make, and great to get the creative juices flowing. So go ahead and start your creative journey today! Thanks for sharing my felt tips Tanya and the 'tickle team'. I hope your readers find it useful!